3D Pinball for Windows - Space Cadet, was a special version of the Space Cadet pinball table, that came bundled with Windows XP, and earlier versions of the Windows operating system including Windows 98, Windows 2000, and Windows ME. The game, which was originally released as one table of Full Tilt! 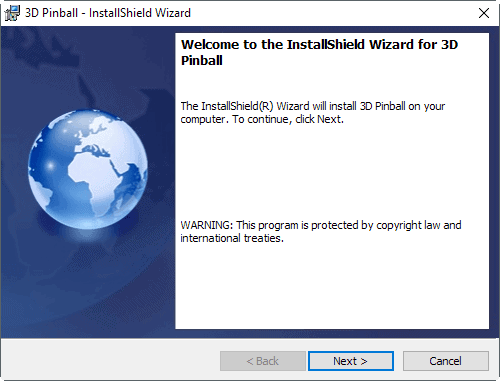 Pinball by Maxis, has not been made available for newer versions of Windows officially. According to Wikipedia, the reason why Microsoft did not include 3D Pinball Space Cadet in Vista or newer versions of Windows was a "collision detection bug" in the 64-bit version of the pinball game. While that may very well be the reason, it may come as a surprise to you that the game runs fine on modern Windows PCs. We have tested 3D Pinball for Windows - Space Cadet on Windows 7 and Windows 10 PCs, and the game ran just fine. The pinball table is available on various download portals. We have uploaded the latest version of the game to our own server for your convenience. The game is fully compatible with all 32-bit and 64-bit versions of Windows. We have tested it on Windows 7 and 10, and it ran fine and without issues. Please note that we don't support the download in any form. The game is provided as a zip file that you need to extract first. You can right-click on 3d-pinball-space-cadet.zip for that and select the extract option that is displayed in the context menu, or use a third-party program such as Bandizip or 7-Zip for that. Double-click on the executable file 3d_pinball.msi afterwards. It is the only file included in the archive. 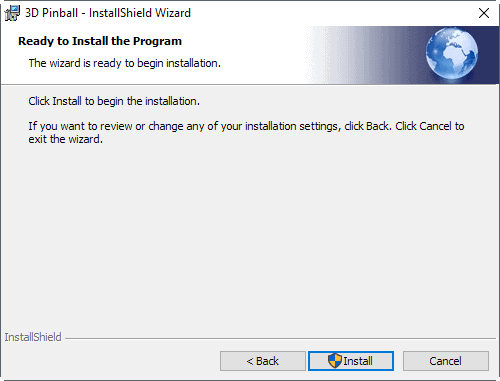 This starts the installation process for 3D Pinball for Windows - Space Cadet on your version of Windows. 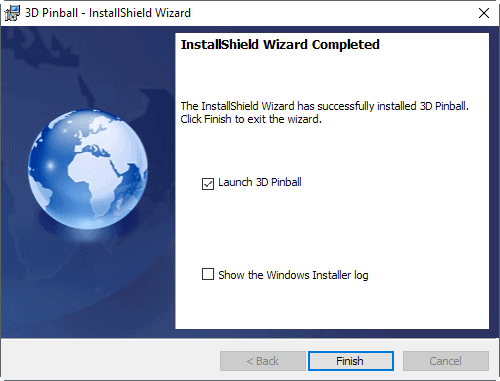 You may check the "launch 3D Pinball" option in the last step of the installation, or launch it manually at any time from the directory. The game does not get added to the Windows Start Menu during installation. You may add it to Start if you run Windows 10 in the following way. Right-click on PINBALL.EXE, and select "Pin to Start" from the context menu. The pinball game has been designed for Windows XP, and it shows. The core issue that you may run into when you play the game is that it supports a resolution of 640x480 only. You cannot change the window size, but may run it in fullscreen which I suggest highly. The reason for that is that the pinball table looks tiny on modern displays when you run it in window mode. If you run the game in fullscreen, it gets a lot better. As far as controls are concerned, you may want to check the Options > Player Controls window. The game did not map the right flipper or right table bump controls properly on the systems that I did install it on. 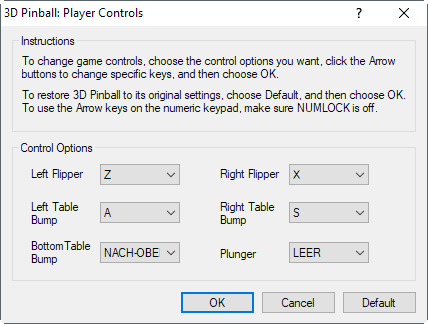 You can map keys if they are missing on your PC as well, or change them as well if you prefer to control the pinball table with different keys. 3D Pinball Space Cadet features several missions, 17 in total, each with their own objectives. While you don't need to complete any missions, they make the game more fun by moving beyond the sole goal of accumulating points. Missions increase in rank and difficulty. You find a complete list of all missions available in Space Cadet on Gamefaqs. 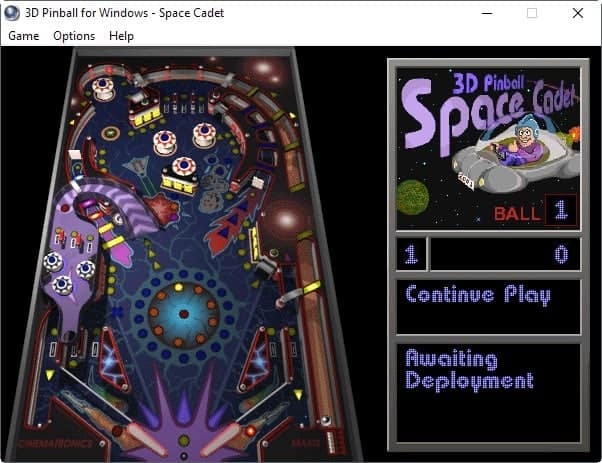 Find out how to download and play the classic game 3D Pinball for Windows - Space Cadet on modern versions of Windows such as Windows 10. Wow I remember this! Thanks for bringing this to my attention 20 years later I’ll be playing it often. Wonder if I can play this on android phone with Exagear? I’ve been running this for years on Windows 7, both 32 and 64 bit. Maxis had a full version that included two other tables, “Dragon’s Keep”, and “Pirates”. BMAX which enables infinite balls. The Maxis full version has higher resolution too. W7 x64. I could not get the cheats from Microsoft to work on full. Will have to try BMAX. Also, have not been able to get high scores to save across sessions. I see the table names and various registry entries are all truncated by one character. Your link does not get you to the game only to a list of your articles which brings you back to this page. Works fine on my end, anyone else having problems? I have the same problem, it automatically redirects to ghacks homepage. Do you run a script blocker or something like that? I have NoScript and disabling it doesn’t fix the problem. That is indeed strange. Can you try a different browser? I plan to move downloads to a new server soon, maybe that is going to resolve the issue. I tried different browsers and computers and the problem is still there, but it worked when I tried using my phone! Wee question, you indicate that it’s the “latest” version (from way back when), but which version might that be? I long ago stashed and imported my favourite XP and pre-XP games (Spider, Freecell, Solitaire, MSHearts, and Space Cadet) and they all work fine with Win10 Pro-64. The version of Space Cadet I’m running is 5.1.2600.5512, no idea if that was the last version, the only version, or something other. Oh, it doesn’t “look great” when run full-screen, it’s adequate, but at least you can see what’s happening as opposed to running it windowed. Cheers.